Makeup is Delicious!! : The Fashion Tag!! SKINNY JEANS, cute blouses, cardigans, tank tops, pretty flats & sandals!! 3. Most expensive item in your closet? My Lacoste sweater! 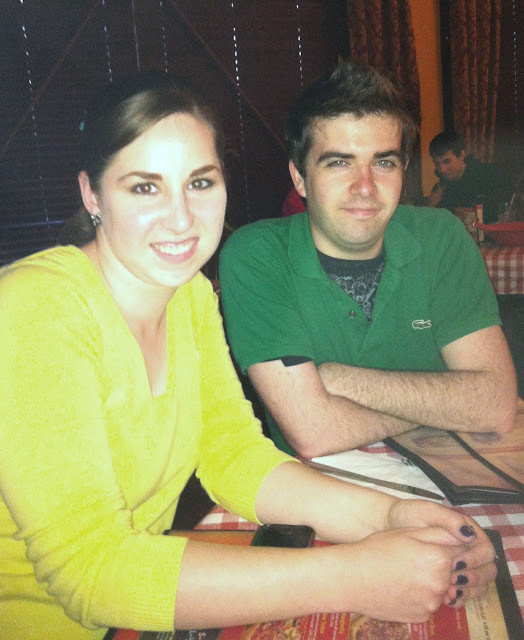 Here is picture of me in it, with my boyfriend :) The lighting was dim in the restaurant so the colors are a bit off. The sweater is a lighter yellow. My boyfriend is also wearing Lacoste. TWINSIES!! I got it on sale for $100; its original price was $150! Micheal Kors, although I only own his Daisy perfume! Oh boy time to come clean… A LOT. Right now I’m trying to be good but I’m constantly shopping… Probably at least $75 a month! 7. What are your favourite stores to shop at? Currently it’s Lovestruck by Vera Wang, but that could change depending on the season/my mood! 9. What's your favourite way to do your hair? I love wearing it straight with a side part. I braid a small section and pin it to the side to keep my hair out of my face. 10. What is your go-to outfit when you have no idea what to wear? Excuse me? I always plan my outfit out the night ahead. I’m constantly daydreaming of what I will wear the next day. BUT if I do happen to be unprepared… skinny jeans, a cute tank and a cardigan! I love this little Garage dress. It’s so versatile. I wear it with a cardigan in the summer, or throw a sweater over it in the fall. I tag: Julz’Obsessions (Julianne), Little Pretty Things (Kerri Jane), Islaay, and Tin of Treats (Rachel Elizabeth)!